No 11 Monalee Heights has been well maintained by its present owners, who have continuously cared for their home over the years, and the front and rear garden have also been carefully sustained and the grass and paving is in pristine condition. Monalee Heights is convenient to all amenities, Knocknacarra church, a variety of schools, Joyce's Shopping Centre, NRG Gym, and Gateway Shopping Centre which houses Dunnes Stores, Next, B&Q and New Look. It also offers easy access to Galway city centre via a good bus route. The ground floor accommodation consists of an entrance hall with wooden flooring; kitchen to the rear of the property with variety of fitted units; sitting room with carpet flooring, stone feature fireplace, and bay window to front of house and double doors leading to kitchen/dining area; dining area to the rear of the property with wooden flooring and double doors to rear garden; and also a guest wc and whb. There are four bedrooms at first floor level with one en suite and main bathroom with corner bath. The property boasts an attractive site with the front garden having a lawn and paved driveway, and the rear garden is well landscaped with both lawn and patio. There are beautiful trees and shrubbery in the rear garden and the area to the gable end of the house is a wider than average size and may be suitable for an extension to the side of the house, subject to planning permission. Additional features include a garden shed to rear of property, which is suitable for housing washing machine and dryer; southwest facing aspect/gardens; oil fired central heating; and a convenient location. The BER is D1. Guide price is €295,000. 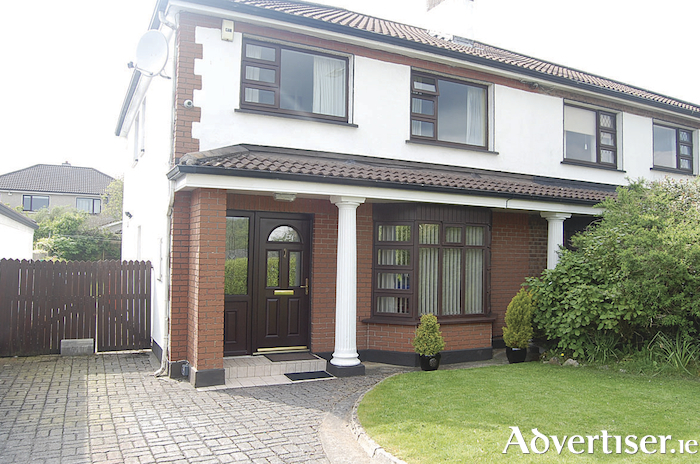 For viewing or for further details of this beautiful family home, contact Lynch auctioneers on 091 566157 or Shane Cox auctioneer on 087 9830450.